Had a nice , quick visit with my daughter at UVM yesterday. Then we (Wayne, my husband and I) went on to look for bird on Mt. Philo and Dead Creek. Saw a few nice species, but no migrating hawks. Returning home via the Brandon gap (Vermont). however, we encountered some unusual "Wild"-life. At Forest Dale there were two pigs in the road! I slowed down and a fire dept. truck behind me stopped, presumably to "Herd pigs". A daunting task. Wayne got this picture of the porkers. Well not long after we encountered a huge bull moose, luckily just at the side of the road. No photos- too close!. The about 30 +/- miles later we came across....guess what? No! Yes! 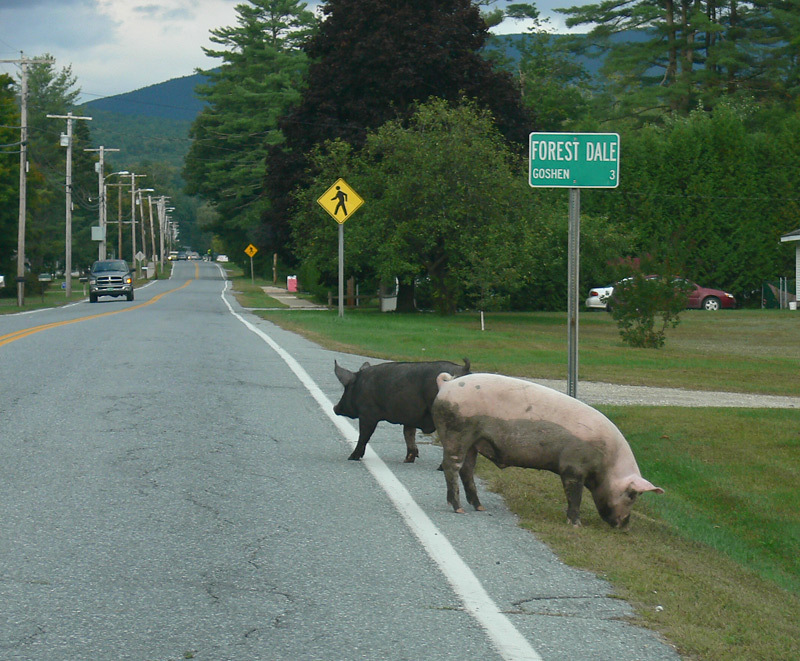 Two more pigs in the road!! How could this be. Pig liberation day? Crazy! This time I got out and talked to them. Th...ey were quite friendly and returned my grunts, but ran off to enjoy their freedom. I flagged down several cars, asking if anyone knew the owners, and trying to keep them from getting hit. They were having such fun exploring and finding good things to snuffle up. Finally a woman came along who found the owners, and as she took over guard duty , we moved along. Wish I knew how they fared. Here's a picture of one, (they looked alike). I added a little warning to this one! So, what gives? Pig liberation day?? YEAH FOR PIG LIBERATION DAY!!! 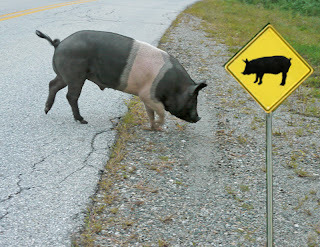 It is about time those portly little porkers got the freedom they deserve.